Mark Twain, the legendary American author and humorist, left behind perhaps the most famous unpublished autobiography in history. Claiming the opinions and stories within were too strong to be received by his public, Twain left instructions that the book was not to be published until 100 years after his death. Samuel Clemens (“Mark Twain”) died on April 21, 1910. Accordingly, the University of California Press published Volume One of the Autobiography of Mark Twain this week, releasing the 760-page first installment of what will be a 3-book series on Monday, November 15. Twain dictated his autobiography in 1906, four years before he died. The text of those dictations, with explanatory editorial notes, have been gathered into these volumes. While unpublished, the autobiography has not been secret — in fact, biographers have had access to it for the last century, so there are no bombshells waiting for us in its pages. Standout sections of this book include Twain’s discussion of his brother Orion, who seems to have been bipolar, and Twain’s account of how he patiently and gently corrected an overzealous editor… there is a lot else here, including a sort of 19th century Paris Hilton – a woman who was famous simply for being famous. That story made me feel better about our crappy media culture – apparently it’s always been crappy, ever since the invention of mass media. Twain, author of The Prince and the Pauper, A Connecticut Yankee in King Arthur’s Court, and The Mysterious Stranger, was one of America’s finest fantasists. 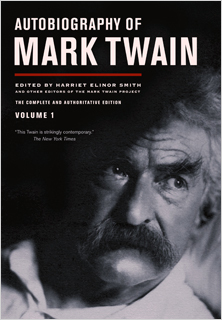 The Autobiography of Mark Twain, Volume One, includes 66 photographs and is priced at $34.95. More information is at the Amazon.com listing. Did you see James Enge’s LJ post about this? Gosh. Two sightings in a week. Makes me think I oughtta read it or sumfin. I didn’t! Send me the link, and I’ll drop a mention into the article. Done. And I stole a quote from James and everything — thanks. Gaaaah, that pirate again. Beat to quarters, and man the guns, Cooney! There WILL come a day where you and James and I are sitting at a table eating INCREDIBLE food. I have envisioned it for at least a year now, and will not consider my life complete, whole or happy until it happens. Okay, well, so I lied a little, I will, because what kind of a way to live is that? But STILL! John, I want us all to sit and eat together. And you two can talk about Mark Twain. You can talk about anything. I will listen. Patty can come too, if she wants. I’m just sayin’. MAKE IT HAPPEN! Obviously, great minds were thinking alike this week. TWO TWAIN POSTS! What is UP with that? We have to have extra special cannons, O’Neill, because according to Howard, these are ZOMBIE pirates. Or maybe I read all those comments wrong. Certainly the selections do not seem completely arbitrary, because Howl doesn’t happen with every entry. Sneaky zombie pirate bastids. Blow a hole in ’em, GULLET TO GIZZARD! Maybe it’s time for a Blog Gate post on Twain’s fantasy? Perhaps you could create spambots that sell X-rated Twain. Come to Chicago soon! Sooner! Soonest! I just discovered it this morning. I will spend all tomorrow evening absorbing it through every available pore. And then I will write about it. I have been in love with Greg Brown’s music lo these many a long year. And now there is a FOLK OPERA retelling of Orpheus wherein he plays HADES??? Unbelievable. And now it’s mine. And soon everyone on Black Gate shall know!! !